Yes, en route from Qin territories to those of the Western Han they had managed to acquire one of those unfeasibly huge glasses of ale and consume half of it before the battle!! NB - the gunk does dry much darker than this. I somehow overestimated how much gunk I'd need and ended up throwing over half of it away. How annoying. Oooh! 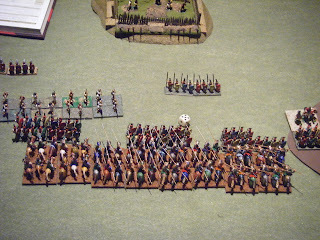 An ancients player with a Roman army - what a surprise! Are they "morally bankrupt" enough to win? Unfortunately, the "0" was mine and the 25 was Tim the Madaxeman's. I'm pretty sure that means that Tim and Seb will be through to the 2nd round, and I have a sneaking suspicion that they could end up squaring off again in the final. Will Seb's Qin Chinese reverse their previous narrow defeat, or will Tim's Western Han Chinese triumph over all? We shall have to wait and see. My meatheads, errmmm, Sarmatians are officially out of the club tournament, so I can relax and learn to play FoG properly with them in friendly matches (of which I have 2 lined up - this Thursday and next Monday). AAR with pics tomorrow if I have time after adding basing gunk to my javelin/light spear troops; otherwise it will be Wednesday. OK, here they are, painted, varnished, Klear/inked and stuck on their bases. It was too late to faff around adding basing gunk tonight, so that will have to wait until Tuesday night as I have my final club tournament match tomorrow night against Tim the Madaxeman and his dastardly Western Han Chinese army. 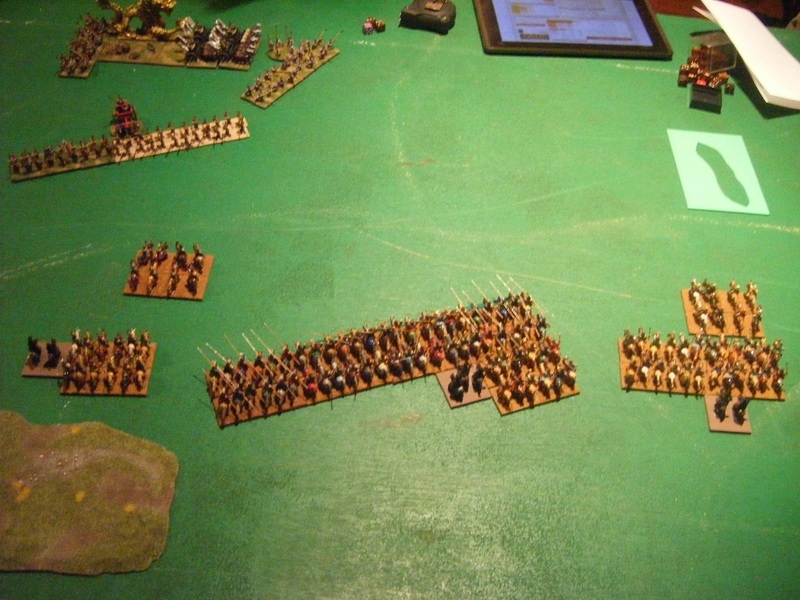 Hopefully my Sarmatians will do a little better this time, as some of their light foot have caught up with the cavalry contingent. Anyway, some pics for your salivation. I'd received a couple of comments that I could have gone darker on the inking, so I mixed up a stronger batch of Klear and Earth Brown (with a couple of drops of black). It seems to work much better (but I need to be more careful about pooling) for these figures, as they *should* look somewhat grungy, being "barbarians". I don't particularly like the parade ground look, but this mix is clearly too grungy for "civilised" troops. 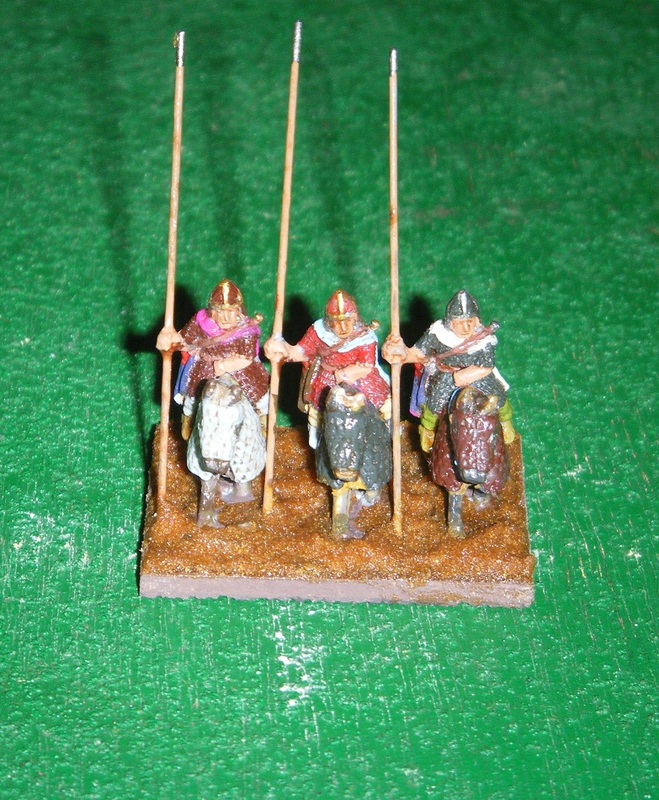 If I do decide to go for a "civilised" army, I'll need to experiment a bit to see what Klear/Ink mix works best. Well, now that they are all painted and varnished (shortly to get their Klear/ink coat) I find myself in a quandary as to whether I should base them as light foot (2 to a base) or medium foot (3 to a base). 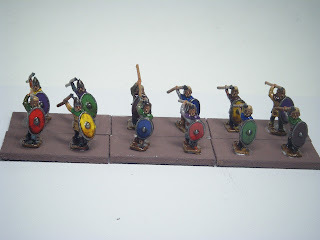 The chances are that I will never use more than the minimum 6 bases of javelin/light spear troops if they are light foot (and then would only use them as a cheap "filler" BG). However, I could see myself potentially using more than 6 bases of MF/Protected/Average/Light Spear. 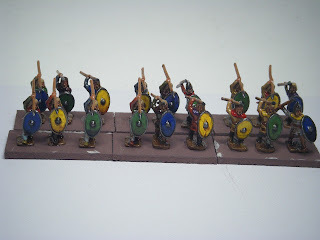 As I already have 6 bases of light foot javelin troops (my Strategia et Tactica ones), there would be no harm in basing these up as medium foot. It would also make a small start towards a Dacian/Carpi army should I decide to go that route. Alternatively, I could do a mix - 6 bases of light foot, 12 bases of medium foot. 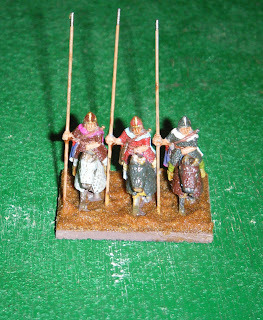 Well, painting progress has been slowed somewhat by my ongoing cold, but I've almost finished the javelin troops now. All that's left to do are the brown-wash, varnish, Klear/ink and basing. The brown-wash will be done tonight, the rest tomorrow. Well, Seb has already posted a batrep of our tournament match on Thursday, but here is my vain attempt to try to salvage some semblance of glory from my ignominous (I think you mean "ignoramus"? Ed.) defeat. Things didn't start too well for me. I'd prepared a number of possible army lists and pulled out ones that I thought might stand some semblance of a chance, put the rest aside and diced to determine which one I'd use*. Unfortunately the list which was all lancers apart from 2 BGs of light horse entered the mix instead of one of the ones with an "invisible cloak of invulnerability to hits from shooting", errrmmmm, Inspired Commander. You'll recall from my previous post that the Gods of dice decided to curse me, and it was the all lancer army that got chosen. *I dice "blind" - the sheets are folded in half, shuffled and then the dice are rolled - so I don't know which list is chosen until I open it up. Then, after a series of tied dice rolls to determine pre-battle initiative, Seb rolled a 4 whilst I rolled a 2, meaning he got to select the terrain. He chose "Developed" for the terrain. Luckily, most of it fell in one corner of my half of the table. Unluckily (don't you mean "stupidly"? Ed.) I decided to base my deployment off that corner. "Where are all the slaves that dragged that thing here?" The Sarmatians had brought an even larger banner with them, but no slaves were required to haul it into position. 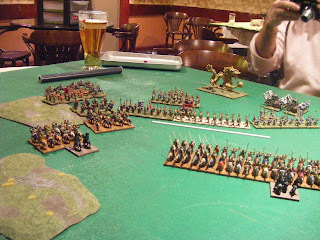 On my left wing, the Sarmatians spotted the biggest glass of ale they'd ever seen and decided to make that their goal. They'd been in need of a good drinking session to get over their defeat against the Classical Indians all week, but the peasants they passed on the march to China never had enough booze to go around the whole army. "OK BSB - you make a feint against their medium foot to divert them away from our real goal - the ale!" "OMG! That is so unfair! These Chinese have brought hi-tech equipment with them to this battle!" 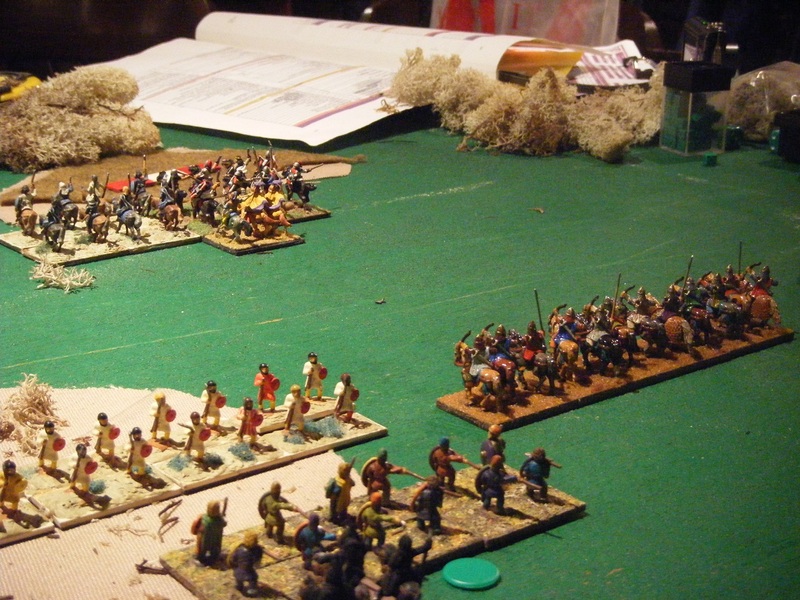 On the Sarmatian left, the light horse take the most direct route to the ale, forgetting that the medium foot to their right have crossbows, making it a 5-dice vs 2 against them in the shooting phase. "Meatheads - prepare to charge ............ Meatheads - charge!!" "Boss, why have they put unpainted wicker fences on the table in front of them?" "Because Seb hasn't painted them yet"
"According to his blog, he hasn't painted those generals either at this point, but there they are, clearly painted"
"Will you just shut up about whether stuff is painted or not? 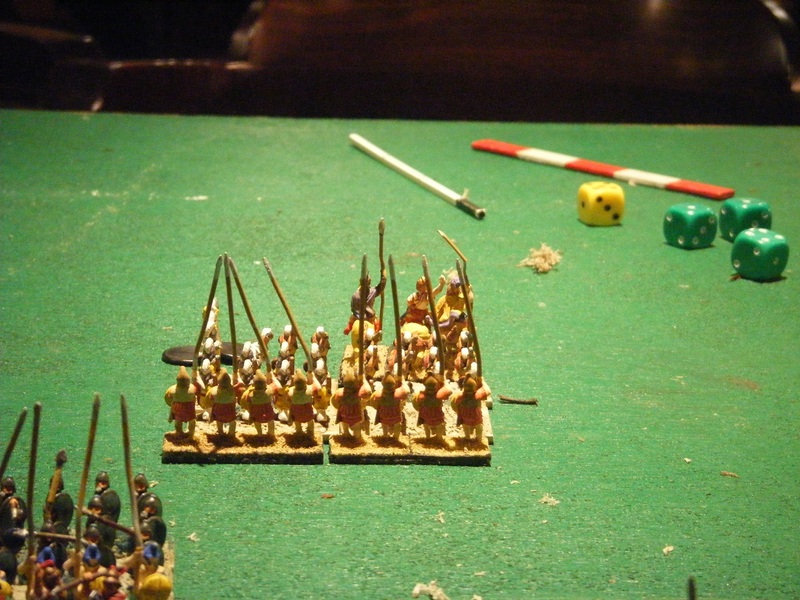 Those wicker fences mean that we'll be on evens at impact, and their supporting crossbows give them 3 dice per file against our 2 - concentrate on that instead!" "We do still re-roll 1s don't we?" "Hmmm, the impact didn't go too well did it? We've lost 1 base each!" "I'd be more worried by these dice we've just rolled for melee if I were you!" "Weren't there more of us a minute ago?" "Blame Tamsin's crappy dice rolls"
Having bounced off the steady foot, one BG managed to fail it's CMT not to charge, and lost the impact, then crappy dice roll dropped it to fragmented. Ooops! Make that "dropped to broken"
Seeing the Qin medium foot step out from behind their wicker fences (which should actually have been removed at this point), a disrupted BG of armoured lancers tries a do-or-die charge and goes fragmented. Won't be long here before they break and pick up a black marker. Meanwhile, over on the Sarmatian right flank, Seb's crossbow-carrying chariots have managed to disrupt and then break my light horse in 2 rounds of shooting. How is that possible? Very, very unlucky dice rolls for the Cohesion test resulting in a double-drop. 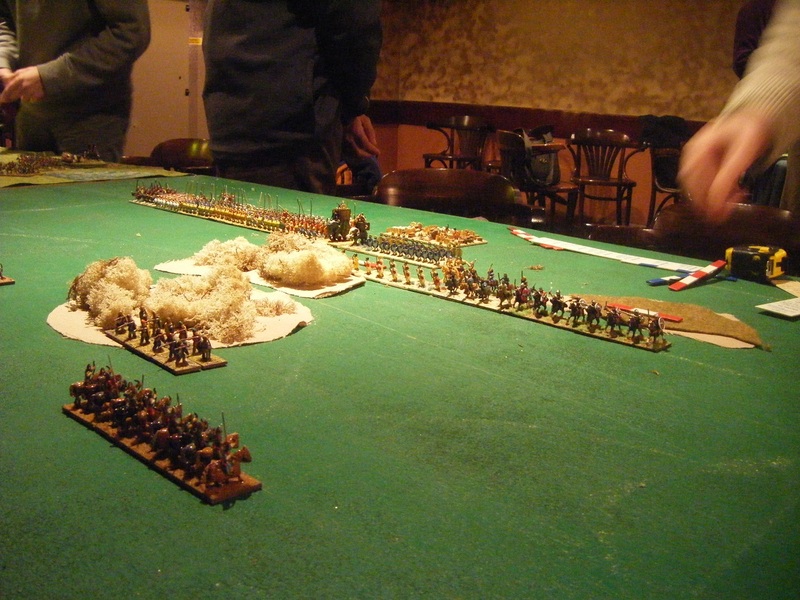 Back to my left flank, where my light horse have charged in against the Chinese light horse (previously disrupted from shooting) and fragmented them. Ooopps! Too late. That's another 2 broken markers. 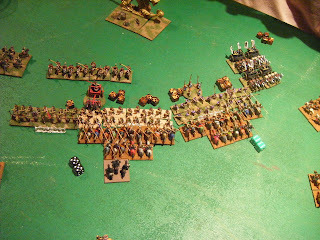 Add those units to the 2 that auto-broke at some point not shown in these pictures, and that makes an army rout. The Sarmatian hospital/mortuary preparing to receive additional casualties from the 3 groups that were broken in the final turn. I always knew that this match was going to be tough, but stupidity and unlucky dice turned the match into an even bigger disaster than the previous battle against Classical Indians. I've since spotted a couple of things we played slightly wrong, but they wouldn't have changed the outcome a great deal, but might have seen a few bases less in the hospital/morgue! *see also the various "my crappy dice rolls" and "my crappy generalship" entries - I generally prepare 2-3 possible army lists, then roll a die to decide which one I'll use. 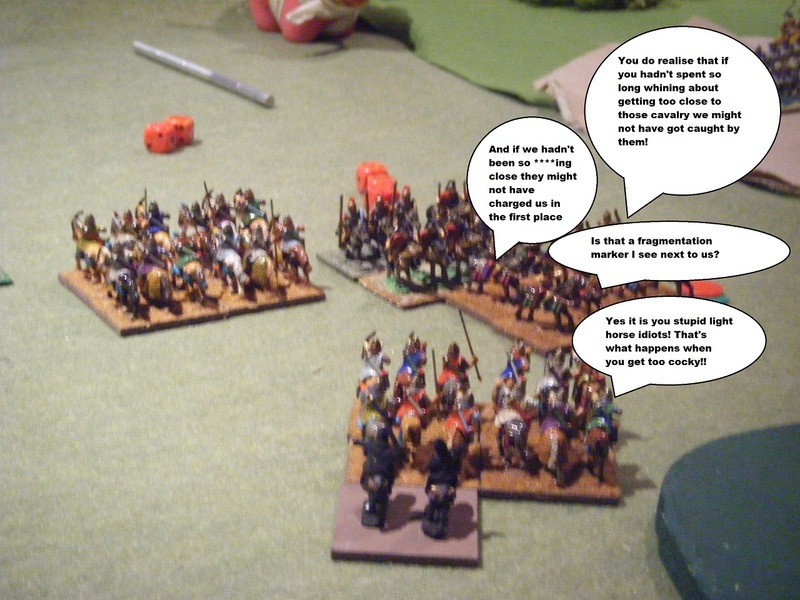 My crappy generalship - I forgot to remove the almost-all-lancer list, then guess what happened next? Here's a big clue - given "my crappy dice rolls", with a 1-in-3 chance of getting the almost-all-lancer list, what die roll did I get? 'nuff said. I think you can also guess the outcome of tonight's battle against Seb's Qin Chinese army. 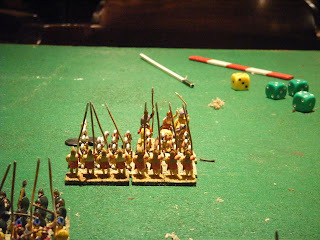 Tomorrow (or possibly this weekend - I think I need to crack on with my javelin troops! ), you will be able to see what developed in (in)glorious technicolor. What? You want to know just how badly they did? Sarmatians: 5 battle groups broken or auto-broken, army rout; approx 50% of bases "off table"
Qin Chinese: 1 battle group fragmented; 2 bases "off table"
My Sarmatians definitely need to regroup before their battle against Tim the Madaxeman's Western Han Chinese (basically the same list as Seb's, with some minor differences). I'm thinking that it might be very sensible to take the maximum of light foot archers so that I at least have a chance of disrupting/fragmenting his BGs before my lancers get stuck in. Maybe an "Inspired Commander" for the magic aura of invulnerability to counteract his shooting? I'm recovering quite nicely from my cold, and was (just about) fit enough to go to work yesterday, so I did. Unfortunately I wasn't quite as fit for work as I'd thought and was absolutely shattered when I got home, so I decided that a quick snooze would be in order. Skip forward almost 3 hours. Yes, I slept for 3 hours on the sofa, leaving not much time for doing any painting. 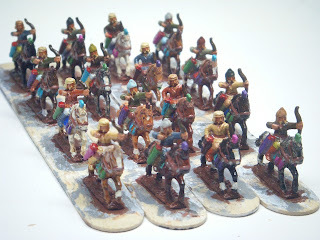 I did manage to "whitewash" all 120 horses, but not to do the brown-wash step. Tonight I have my second club tournament match against Seb's Qin Chinese - hopefully the result won't be as disastrous as it was against Gordon's Classical Indians! AAR with pics tomorrow, if you're lucky. My cold is better today, but still drained of energy. And I had to spend 6 hours without internet access - my ISP decided to do some maintenance to the hardware in my local ADSL exchange because "there was a problem". Funnily enough, I hadn't noticed any issues with my DSL connection up to that point. Anyway, that's enough of the trivial stuff, so let's get to the important things - painting miniatures. In between sneezing and nose-blowings I did manage to get a fair bit of painting done on the javelin troops, more than I'd realised now I look at them. Looking at what is left to do, I may do a bit more tomorrow night, in between the "whitewash" and brown-wash steps on the horses. As I've rearranged my FoG tournament match against Seb to Thursday night, so with writing up the AAR on Friday, it probably means the figures will be finished at the weekend. And I still need to work out how to paint the riders separately from the horses - any suggestions for fixing them to painting sticks? I'm thinking of perhaps covering the sticks with masking tape, then attaching the riders by their feet with superglue (or maybe UHU). Would that work? Well, my cold was a bit better today, although my energy levels were still down but at least I wasn't as achey and my chest didn't feel as clogged up. In between bouts of coughing, sneezing, nose blowing etc I did manage to get all 120 horses primed with gesso (quick check - all grey, no green = none accidentally primed with mucus *lol*). Nope, no green primer there! I wasn't totally happy with the wash stage when I did the horses for my "other cavalry", so this evening I played around testing a few mixes to see if they might do better. I eventually settled on 3 new mixes - 1 for chestnuts, 1 for duns and roans and 1 for the very occasional palominos that I might paint (although it could perhaps be used for creams as well - I'll be giving it a tryout with some of these horses). I also need to remember to use a thinned-down version of the black wash, particularly when doing the dark-greys. 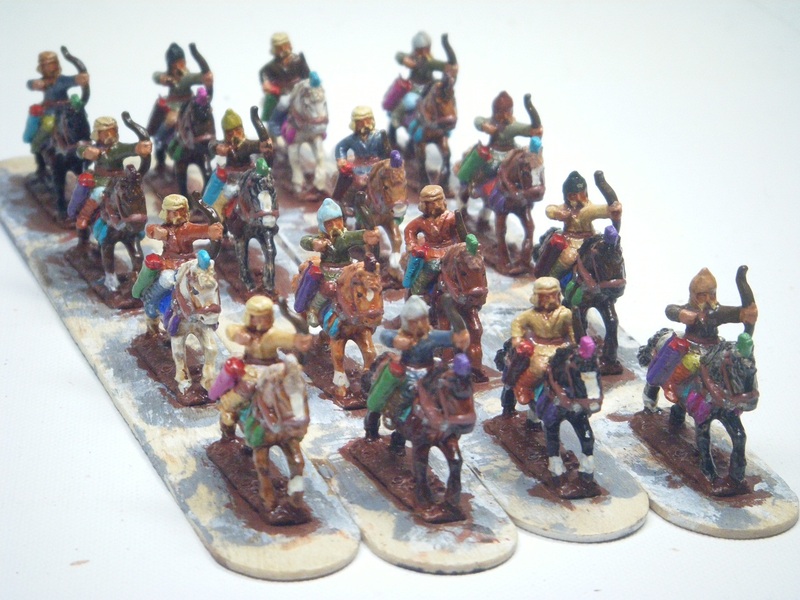 Tomorrow, if my cold permits, I'll make some headway on the 48 javelin troops, then on Wednesday I'll do a "whitewash" on the horses, followed by the brown-wash to pick out details. Ooops, sorry about that - probably "too much information". I really do hope that none of you catch this one though, as it is absolutely horrible. I'm not up to doing the gesso priming today - hopefully tomorrow my cold will have eased up enough for me to do that job. For the non-barded horses, there were 14 of one pose, 28 of another and 39 of a third. To try to ensure that I get an even distribution of colourings across the poses, I've done 14 sticks with 1 of each pose. The other sticks have single poses on them. I've had a cold for the past week, and it seems to have finally run my energy levels down. This means I haven't felt like doing very much at all. Last night and this afternoon I did do a simple job - making up some measuring sticks and arc of fire pieces for FoG. The sticks were made from 2mm x 4mm styrene strip, marked out in 1" or 40mm segments. The arc-of-fire templates were cut from 2mm styrene sheet - I wish I'd used thinner sheet as it would have made the cutting so much easier. I then used Sharpie marker pens to colour them. Well, I haven't picked up a paintbrush in anger for several days now. 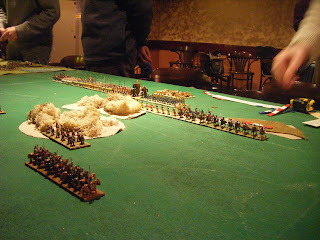 On Wednesday I was just dog tired and wouldn't have been able to concentrate on what I was doing; Monday and Thursday nights I was playing FoG at Central London Wargames Club; Tuesday and Thursday nights were taken up with downloading and uploading my photos and writing up the AARs. If all goes to plan (and my cold starts to ease up) I should be back to painting-painting in a couple of days (as opposed to priming-painting - see next item). 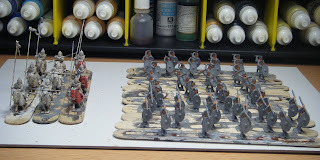 Once the horses (see below) are gesso-primed, I'll crack on with the javelin troops I did the flesh on a few days back; followed by the generals. As the competition game I had scheduled for Monday night is postponed (get well soon Seb's daughter!) and don't have a game scheduled for Thursday, that should give me a clear run this week to get the painting finished before I move on to painting the horses. Hmmmm, I'm going to have to prep 120 riders as well aren't I? You may recall that I'd prepped 40 or so of the remaining unpainted horses the other day. Well, I managed to prep the rest this afternoon/evening. They are currently sitting in a bowl of dishwater (clean stuff, not used!!) for degreasing and I'll be rinsing them shortly then setting them out to dry overnight. Tomorrow will be a big gluing-onto-painting-sticks session, and possibly (time allowing) gesso-priming session. 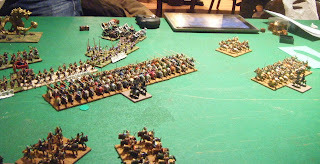 OK, here are a couple of pics taken during last night's battle. I've uploaded all I took to Flickr, but here are a couple for you to have a sneak peek. Hmmm, there's a gap in the wall of battle wagons. If only I had some troops nearby who could zip through into the enemy's rear area - can anybody see some that I could use? Disastrous is the best description of the outcome. At close of play, 3 broken BGs and 2 fragmented against, errrr, 2 disrupted. 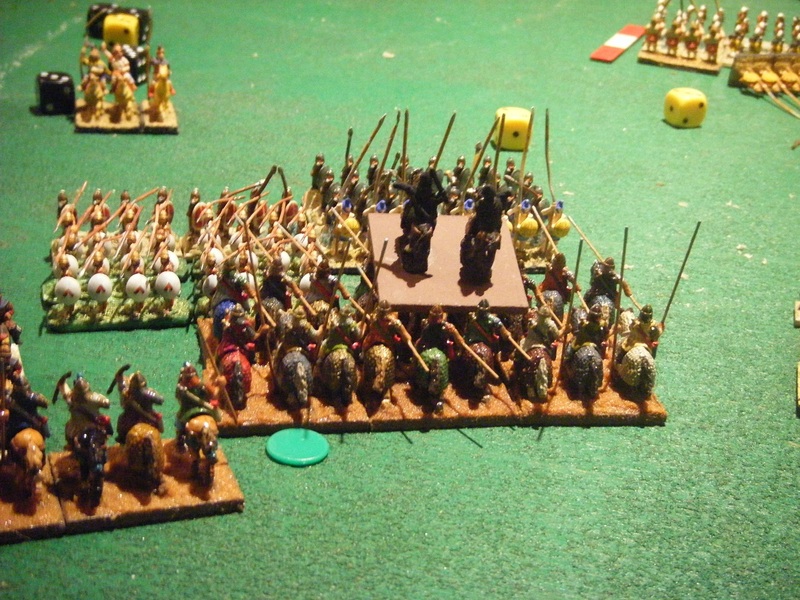 The only upside for my Sarmatians was that they won the pre-battle phase. Oh, and some incredibly lucky dice rolls -"We're fighting elephants, are fragmented, have lost 2 of our 4 bases, seen our neighbours break and our rear support has just engaged in its own combat? Pahhh, we don't care!" *******Newsflash: 1 BG of light horse were last seen fleeing across North Africa, closely pursued by the Carthaginian cavalry they had been taunting. OK, so what were the BSBoBSMoBSHwLSPT facing? Battle wagons - "errr, hang on a minute - where did those come from? 3 BGs of them on Gordon's left flank as the final tranche! You have got to be kidding?!?!?!" I must admit that the battle wagons totally threw me and I right-royally messed up from that point onwards. Decided to move the BSBoBSMoBSHwLSPT across towards my left where it would be facing the MF archers and nelliephants. Oh well, we live and learn. I knew this would be a difficult tie for my cavalry-heavy army and succeeded in wrecking any chance I might have had through my own idiocy. Hopefully my Sarmatians will give a better account of themselves in these two battles. If you are unlucky, and I am blase enough, I might post some pics tomorrow night. 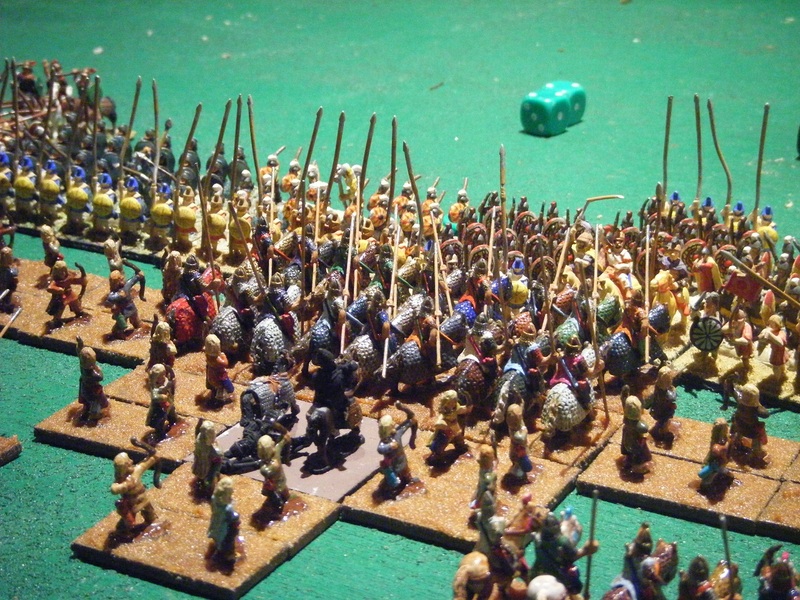 1) Lots (and lots, and even more lots) of medium foot bow/sword troops. Well, their archery at any rate - once in contact the BSBoBSMoBSHwLSPT should knock them out pretty quickly. It's getting there without base loss and drops in cohesion level that could be difficult. My spies report that the Indians recently fought against 2 Chinese armies and had nine 8-base battle groups of the MF Bw/Swd troops with 4 other battle groups (1 of which must have been Nellies, 1 some crap cavalry and 1 some crap light foot javelin troops). However, their Chinese opponents would have been MF-heavy so Gordon may be fielding a different mix of troops against my cavalry-heavy Sarmatians. So, what will my army look like? Apparently some naughty Roman Equites told my light horse that Carthaginian cavalry is good fun to taunt, and they were last seen heading in the direction of North Africa so won't be joining my army tomorrow night (or will they?). Once all three tournament matches are over and done with I will be posting detailed AARs with lots of pics as you have come to expect. Anyway, onto the AAR. I took lots of pics, far too many to include here and far too many to not let you see them all so I've set up a Flickr account, uploaded the full size originals and added some text to each to describe my FoG match. To view them click here. I have resized and done my thing with a few of the pics, for those who don't want to view the whole lot. I'll intersperse the smaller pics throughout the AAR. Infantry? Are those the things we trample under our horses' hooves? Predictably with my +3 I won the die roll for pre-battle initiative and opted for Steppes as the terrain. My selections were 1 compulsory open piece, 2 more (non-compulsory) open pieces and a gully, Jerry took his compulsory open piece, a gentle hill, broken ground and scrub. I was much luckier with terrain placement in this game, with only the broken ground in a position that could make things awkward for me. 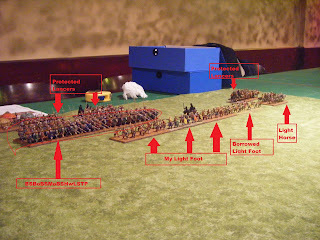 However, it was central and allowed me to commit a heavy flanking force against Jerry's weak left wing, the main problem being negotiating the gap between the rough ground and the gentle hill with all those cavalry BGs without them getting in each others' way. What about the scrub? Well, that didn't make it onto the table - the die roll would have placed it touching one of my side edges, but as it was the last piece to be placed there wasn't room for it on either. 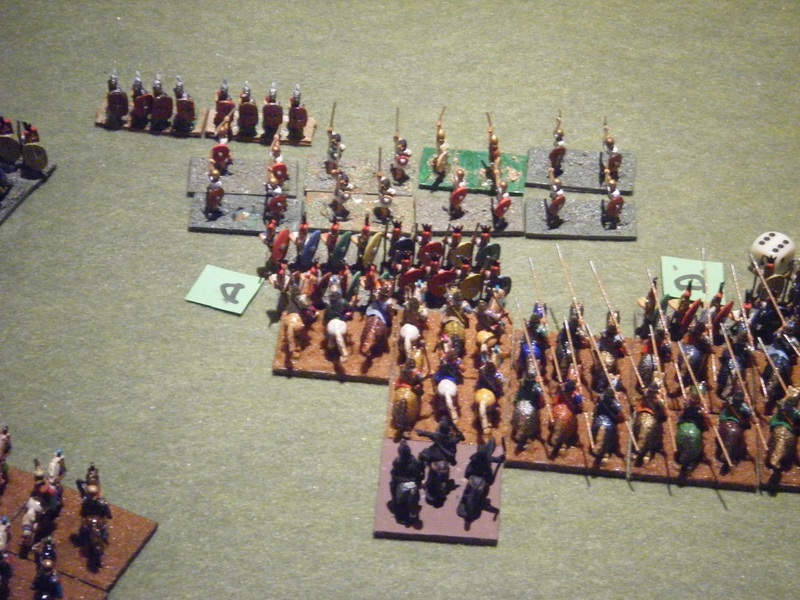 Jerry (rather oddly in my opinion) decided to deploy his Romans across a wide frontage with spaces between his battle groups. "See - they do have a few horses!" "Yeah, that tiny group on their far left wing, next to some infantry"
My deployment was pretty obvious once I saw the way Jerry's Romans were positioning themselves. Large block of lancers in my centre, decent size block of lancers on my right wing, 1BG of lancers to cover my left wing to prevent a flanking march around the gully. "Infantry? Were we meant to bring some?" 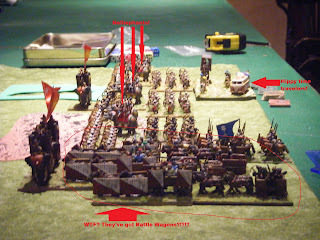 What on earth was I thinking when I stuck 1 BG of protected lancers on the end of the 3 BG block of armoured lancers? Why did I put the 4th BG of armoured lancers in my right wing "brigade"? The invincible Romans tramp forward very, very slowly. 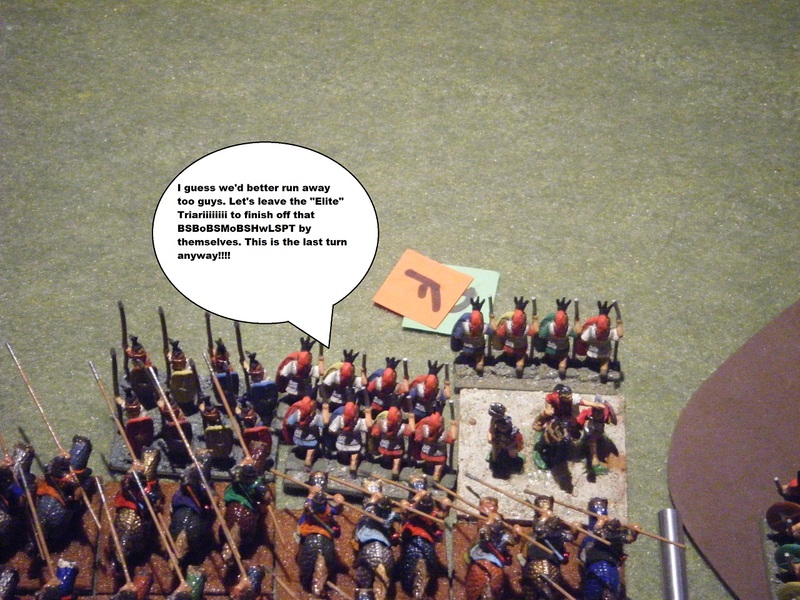 My Sarmatians' reaction - "Wotever!" 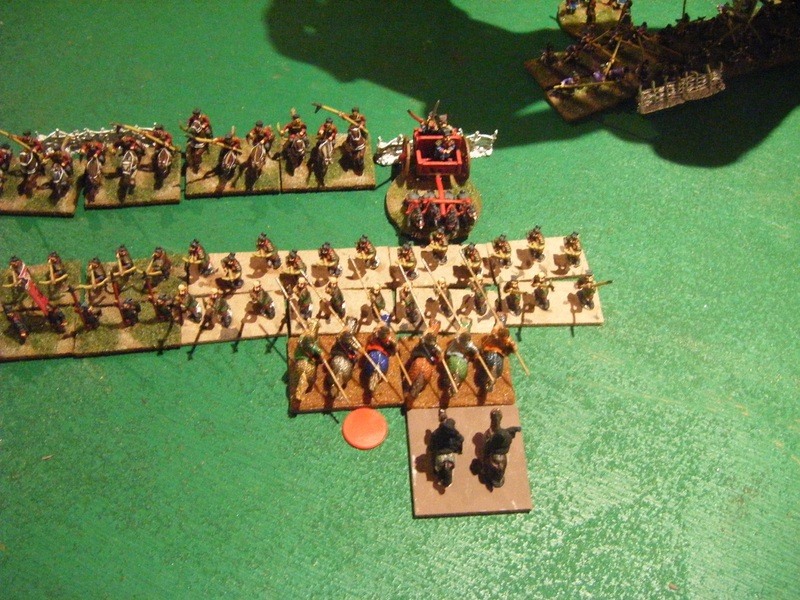 Turn 2: Sarmatians move forward. 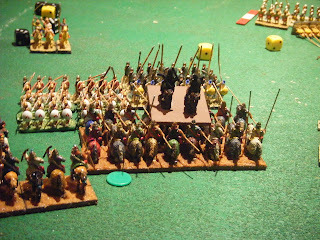 Light horse BGs get inside 2 inches of the Velites (just to get some dice rolling. OK, you've got me - I'm an idiot who didn't measure the distance properly and took myself in range of them when I could have happily shot at them without them shooting back if I hadn't been such an idiot). Turn 3: Romans crawl forward at snails' pace again and expand from 1 base wide to 2 bases wide. Some more shooting, resulting in the first disruption marker being awarded to ....... some Roman Velites. 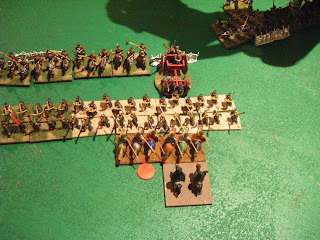 Turn 4: the light horse on my left wing considered it wise to get out of the way of the fast-approaching block of lancers. The big scary block of big scary men on big scary horses with long scary pointy things (hereafter to be known as "BSBoBSMoBSHwLSPT") moved forward. Unfortunately the end BG, who were protected lancers in 2 ranks (*smacks back of head again* should have put the 4th Armoured Lancer BG there instead) came within range of some Velites who decided to chuck some javelins at them. 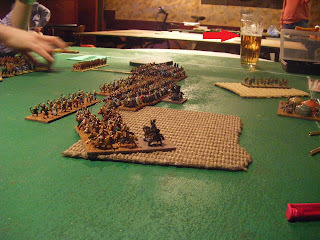 This resulted in the battle's second disruption marker being laid. Turn 5: The Legions inched forward to within charge range of the BSBoBSMoBSHwLSPT, the fools. A little bit of totally ineffective shooting followed by rallying attempts on the 2 disrupted BGs - both successful. Turn 6: The BSBoBSMoBSHwLSPT would have had to do a CMT not to charge against the Romans. Not charge? Whaddya mean not charge? Forward they went. 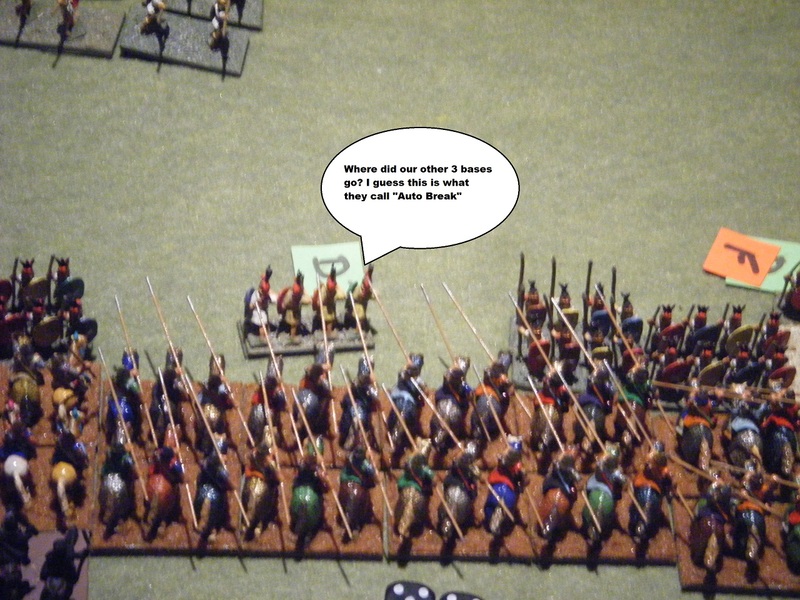 The Velites ran like sissies to hide behind the Legions, who suddenly, not to mention painfully, discovered what LCpl Jones meant by "they don't like it up 'em, Mr Mainwairing!". The following melee resulted in all the Legion BGs receiving disruption markers as well as 1 suffering a base loss (first casualties of the game). Yeehah! My BSBoBSMoBSHwLSPT didn't have to break off! 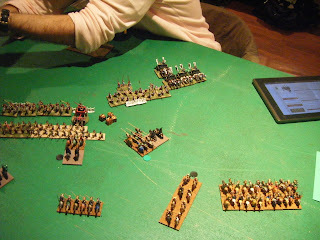 Editing to add: the protected lancers who were charging the evading Velites rolled a 3 for variable move and ended up 1/4 inch short of the third BG of Legion, so no impact to resolve at that end. Turn 7: some Romans decided to charge (edit to add: including the Legion that my protected lancers didn't quite reach), and lost all the impacts but one. That one was on my right wing where my light horse had decided to taunt his cavalry by shooting arrows at them and calling them rude names. 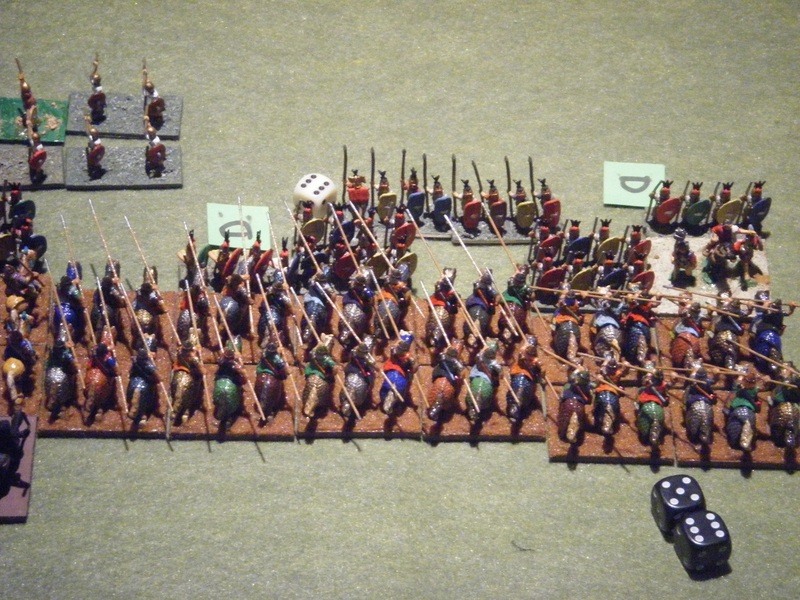 The Romans rolled very long for their charge move, the light horse rolled very short for their evade and got caught in the rear. Oh dear, that'll be an automatic disruption marker. Somehow the impact resulted in a draw. The melee phase saw the light horse drop to fragmented. Confession time: we messed up at this point, although overall the end result of the battle would have been much the same. What should have happened: The light horse should have turned to face the cavalry and the melee should have continued in Turn 8. This would almost certainly have seen the light horse drop to broken, they would have routed directly to the rear, the Roman cavalry would have pursued and would have been engaged by the lancers. It would just have been delayed by 1 turn and I would only have lost 1 extra attrition point in the final tally making it a 5-3 rather than 5-2 win. What did happen: in the Joint Action Phase we continued the evasion and pursuit. Why did it happen? : I think we had just been discussing what happens when a unit breaks and is pursued and confused ourselves into applying it here. The BSBoBSMoBSHwLSPT vs scrum continued in a nicely damaging (to the Romans) fashion. ooooh - look - a third Legion with a disruption marker!!! Turn 8: meanwhile further up the field on my right wing, the commander of the BG of protected lancers who weren't in a melee was planning to head forwards and turn in to sweep around the rear of the Roman lines. 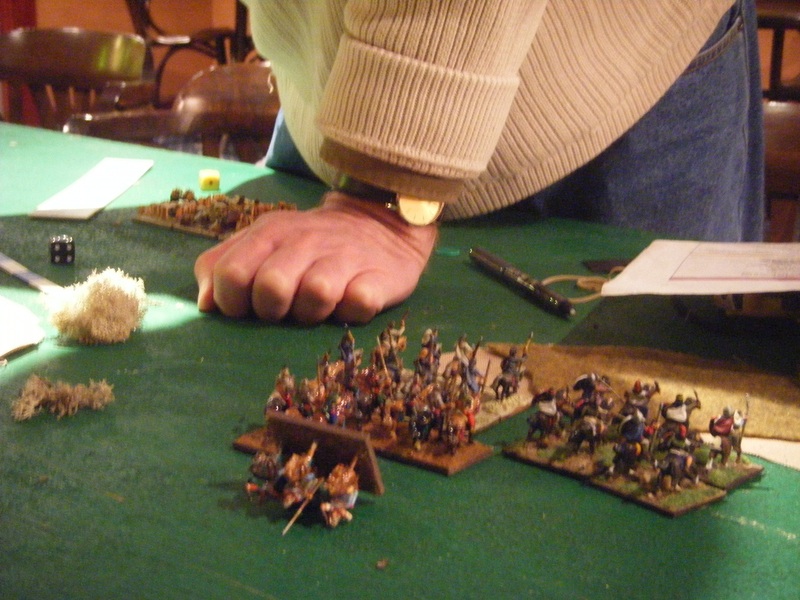 Unfortunately his warriors decided that they'd much prefer to join in on the melee that the armoured lancer BG next door was in so substituted the low-rolling weighted dice into my hand so that their CMT to not charge failed. Grrrr, they got a sound talking to when the army returned to the camp. 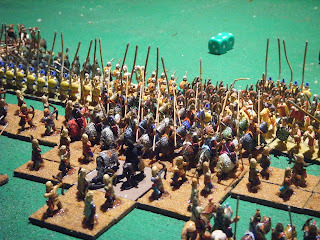 This took that melee up to 6 dice vs 3, so the Romans were looking decidedly worried. On my left wing, the light horse decided that perhaps there might be some targets they could shoot arrows and hurl insults at over in the centre of the battlefield, so they did a 90 and headed round behind the BSBoBSMoBSHwLSPT. 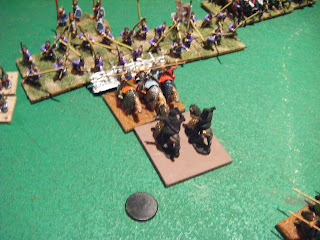 The BSBoBSMoBSHwLSPT continued it's brawl with the Roman Legions, dropping one of them to fragmented and another to 2 bases. At this point we had just reached the 2 hr 10 min base-time-limit for the match and rolled 1D6 each, added them together, doubled it and added that as extra time, giving us an extra 14 minutes to complete 1 turn each. 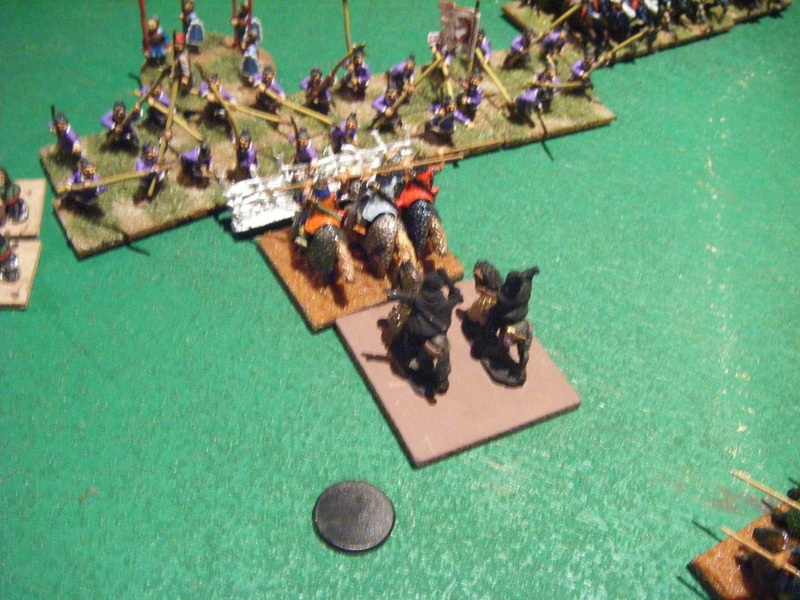 Turn 9: 2 more Roman BGs decided to charge into existing melees and both lost their impacts. One of these charges was a 2-base BG of Elite Triariiiiiiii shifting into a gap between two Legion BGs. A Legion that had been standing around twiddling its thumbs for the last 8 turns decided it was time to do a pretty complex bit of manoeuvring on my-right of the BSBoBSMoBSHwLSPT by moving forward and turning 90 to threaten its flank. 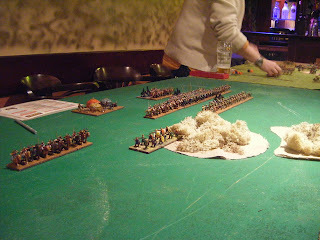 Turn 10: My light horse managed to move into a position where they could shoot at the Legion attempting the tricksy manoeuvre, not that it had any effect. Onto the melees. The middle of the three Legion BGs being mashed by my BSBoBSMoBSHwLSPT lost a base (the two BGs in contact rolled 6 hits against his one!! ), leaving it with just one base. Oh dear, I do believe that is called an "Auto Break". OK, let's resolve all the other melees and then see which units are affected by that. Oh dear, another Legion loses a base. Legion on their right - never liked those guys anyway. I think they were from Pompeii. 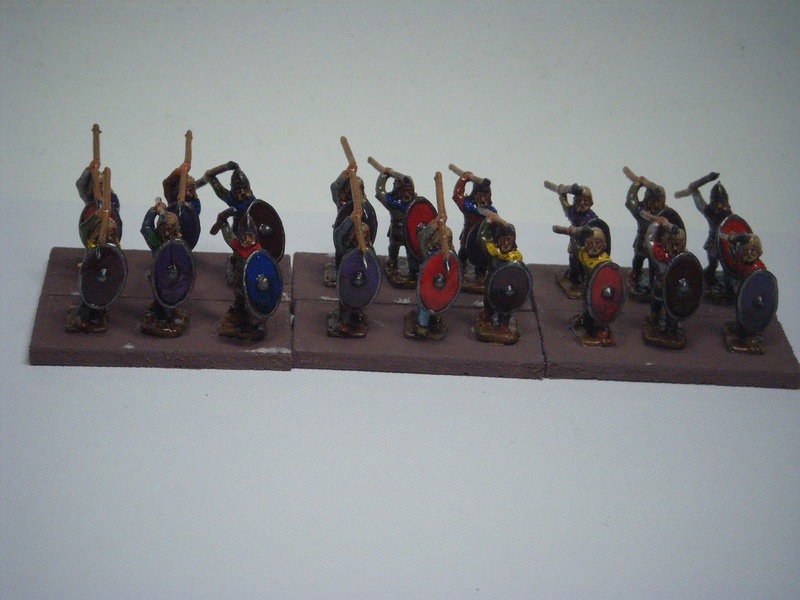 Elite Triariiiiiii - we don't give a tuppeny bit about those Hastati & Principes being destroyed. Legion on their left, beyond the Triariiiii, who are fragmented - "I think it's time to run away from this BSBoBSMoBSHwLSPT!" "I think so too - ruuuunnnnnn!!!!!!!!!!" Tricksy-Manoeuvring Legion (seeing the previously-fragmented Legion break) - "oh crap, those gits have made us have to test. Oh, double-crap - we've picked up a disrupted marker!" 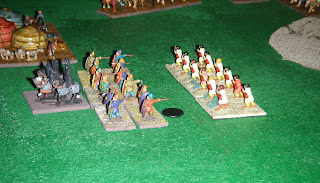 Other melees were going on on the wings, with some Roman base losses. The final stage of this melee phase was the inital routs and pursuits, which saw the Legion which failed its cohesion test and broke being caught in the rear by the lancers (automatic base loss) and then losing another base when we did the impact. Confession time: we made two minor errors here.The legion which auto-broke did a rout, with a pursuit by the lancer BG it had been facing. It should have simply been removed from the table and not pursued. 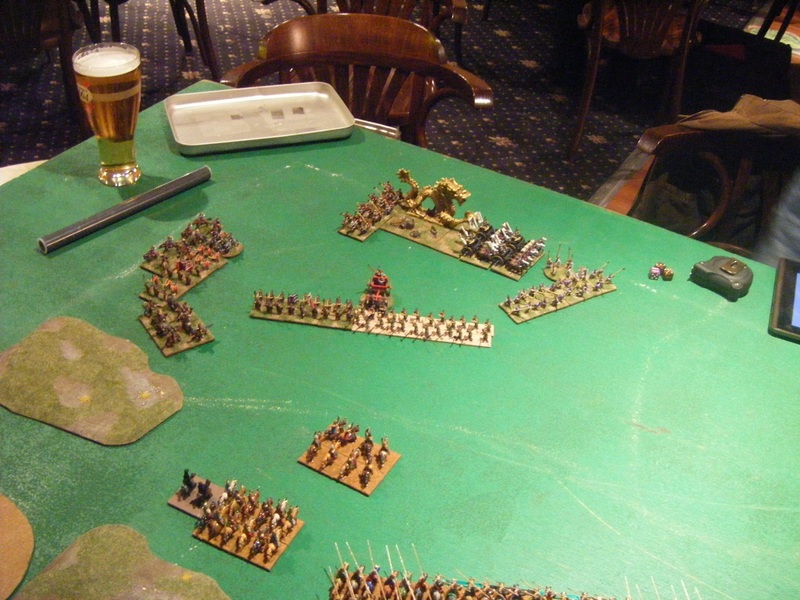 This would have left the lancers in overlap of the melee to their left (and those protected lancers on the end of the BSBoBSMoBSHwLSPT would have appreciated their assistance - there was talk of buying kegs of ale if they helped out. The Legion they were facing had in the last melee phase managed to drop them to fragmented! 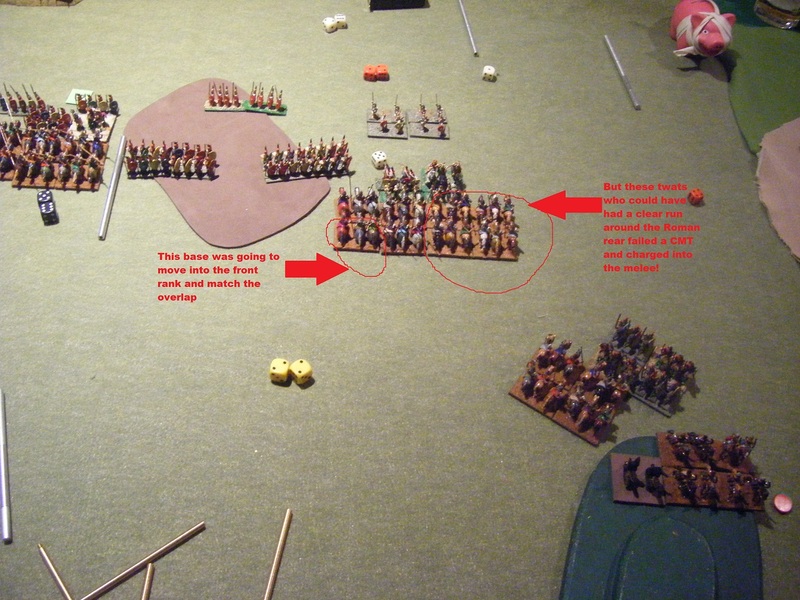 The Legion which broke on seeing the auto-break was correctly routed and pursued, caught in the rear (automatic base loss) but the impact should not have been resolved at this point - it should have been in the impact phase at the beginning of Turn 11 if the game had continued. However, neither of these would have affected the outcome of the battle. 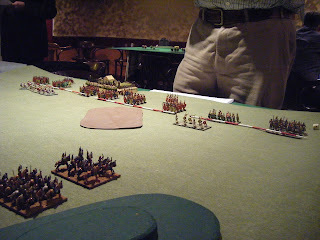 Under our club's tournament rules, as this was the final turn there would be no joint action phase. 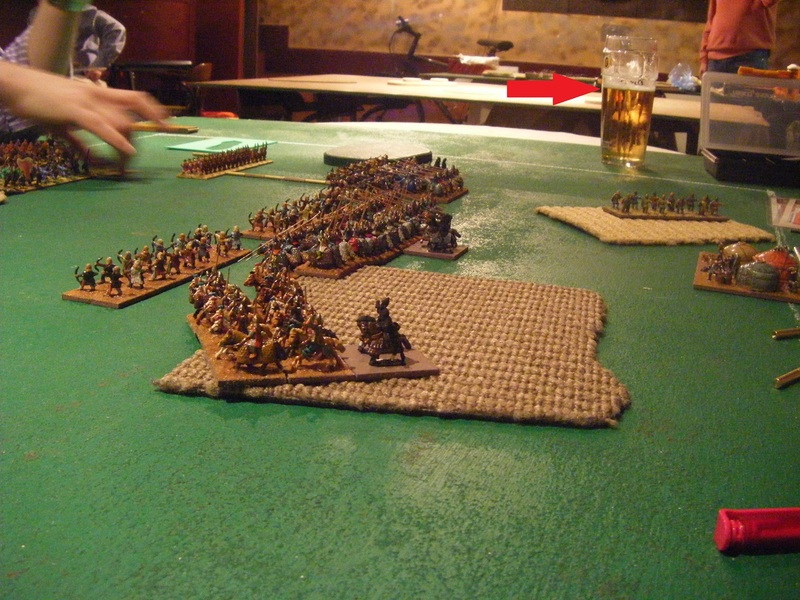 Oh, and I spotted another rules mistake we'd been making - we had both thought it was odd that disrupted and fragmented units didn't seem to suffer ill effects in close combat. We'd missed the line at the bottom of the quick reference sheets where it deal with that part (lose 1 dice per 3 if disrupted; 1 per 2 if fragmented). In pretty much every case this would have been in my favour if we had thought to look all the way down the sheets, so it could have been an even bigger or earlier win for me. 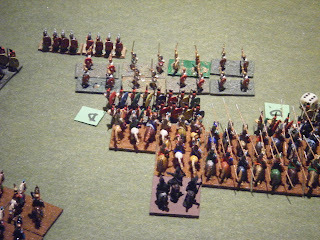 Also that the light horse should have been down 1 dice per 2 in their impact and melee with the Roman cavalry. Conclusions and what did I learn? 1. Roman Legions don't like it up 'em, Mr Mainwairing! In other words a BSBoBSMoBSHwLSPT rocks. It would probably have rocked even better if I hadn't stupidly put a BG of protected lancers on one end when I could have put the 4th BG of armoured lancers there. 6. 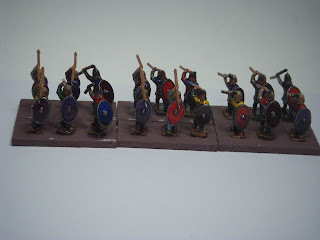 I was greatly helped by Jerry's deployment - the gaps between his blocks of Hastati/Principes meant that in melee my BSBoBSMoBSHwLSPT got extra dice for overlap, although there were some rear-rank bases that couldn't contribute dice. However, he couldn't expand to match the overlaps as this would have brought my sitting-idle-not-contributing-dice bases into the fray and he would have BGs throwing 4 melee dice against up to 8 from mine instead of the 6 they were facing by not expanding to match. I think his original plan was for the Triariiiiii to storm into the gaps, but only one of those BGs managed to do so, and that was too late to be much help. 7. I might have been better off dropping one of the BGs of protected lancers and using the 48 points to upgrade the remaining 3 to Armoured. Actually, I'd probably have changed them to 2 sixes which would have been useful on the wings. 9. I must make sure that my light horse only taunt enemy cavalry if they have some lancers who can actually intercept the cavalry charge!! 10. I am an idiot who really must learn the rules! 1. If you are going to leave gaps between your Hastati/Principes for the Triariiiiii to step into, you should probably consider using larger BGs, which will also be less liable to auto-break and could allow you to move into or match overlap positions for melee. 2. You might want to deploy across a narrower frontage, particularly against an opponent with lots of heavy cavalry. Overall, it was a good fun game and I think Jerry and I both learnt a lot from it. My thanks to Jerry for last night and here's wishing him good luck in his group matches for the club tournament. Yup, that's right - I won my FoG match this evening. At the point the match was called (we'd reached the allotted time) my opponent, Jerry, had 2 BGs broken and off the table, and another BG fragmented versus just 2 BGs of mine which were fragmented. 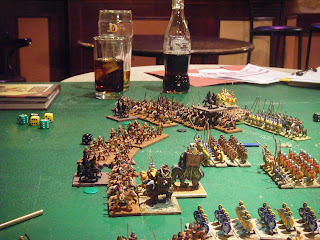 If the game had continued another turn or 2 I think my Sarmatians would have sent their Mid Republican Roman opponents into Army Rout. Oh, and I'd only lost 2 bases, both of Protected Lancers. Another oh! 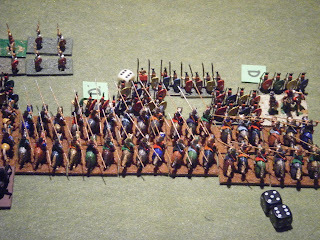 - my army was all cavalry this evening. 4 BGs of Armoured Lancers, 4 of Protected Lancers, 2 of Light Horse (all 4-base BGs). Full AAR tomorrow, with lots of pics. I'd love to have posted a couple of teaser pics but my camera battery ran out right at the end so I haven't been able to upload them yet. ps Seb and "Madaxeman" Tim had their tournament match this evening - Qin Chinese vs Han Chinese. I think Seb lost, but not heavily. And his figures look even nicer in real life than as pixels on his blog. Looking at my workbench yesterday, I realised that if I carried on with painting the javelin troops I would only have 9 figures (the lancers for my command groups) ready to work on next. "Ho, hum" thought I "perhaps I should institute Tamsin's Equine Development Facility without further ado". So, last night I spent a couple of hours prepping 42 unbarded horses. That leaves 39 more unbarded horses and 39 barded horses to be prepped. Once they are all prepped it will be onto the painting sticks, slap on the gesso and then set to work on painting them "en masse". Well, just about completed. As with the rest of my Sarmatians, the bases need to be dry-brushed, have flock etc added and then a final spray coat of matt varnish. I've re-worked my army list for tomorrow night's game and they will be joining the army. Right now I'm torn between 2 variants on my army list - one with all mounted battle groups and one which includes light infantry. I'll have to decide which before I go to bed tonight so that I can have them packed and ready to go in the morning. 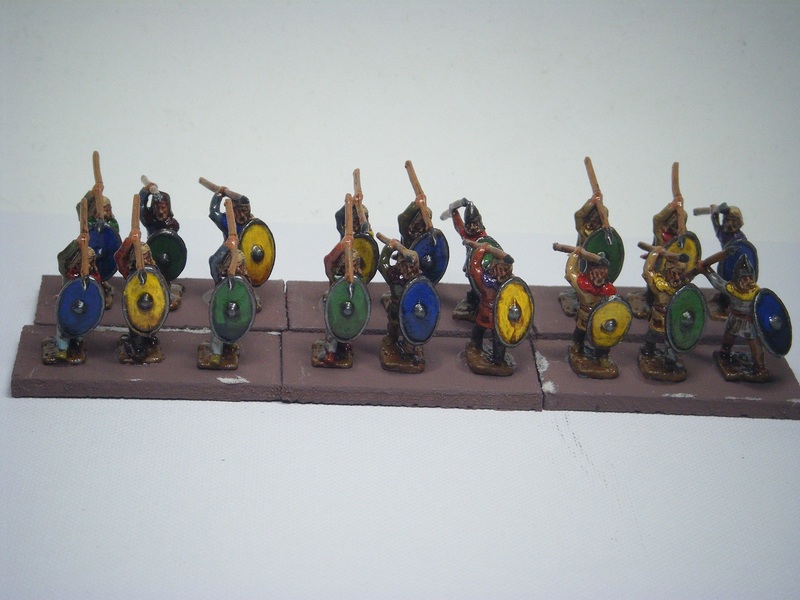 I've started work on the javelin troops (flesh done), but I'm in no great rush to finish them so will take it easy. If I'm really lucky, they'll be ready for basing by Friday, but more likely it will be next weekend. 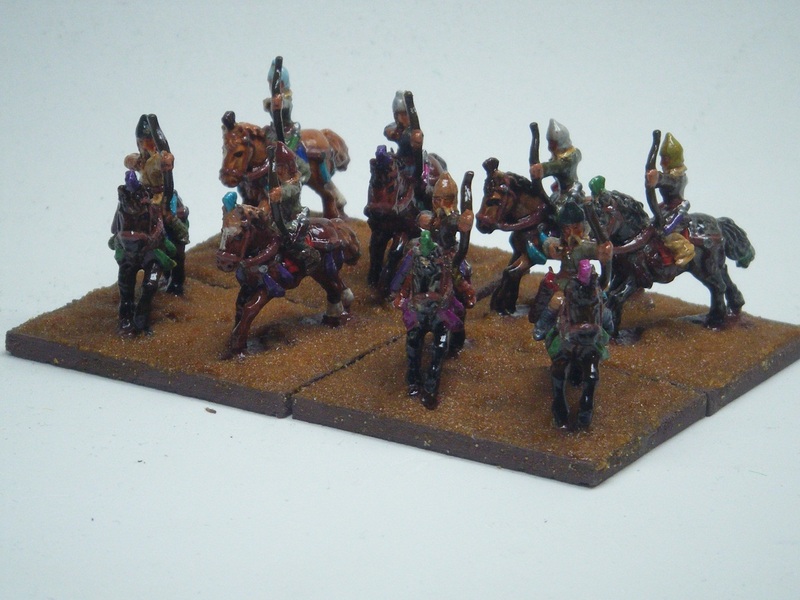 With the remaining Sarmatian cavalry I'm thinking of painting the riders and horses separately. 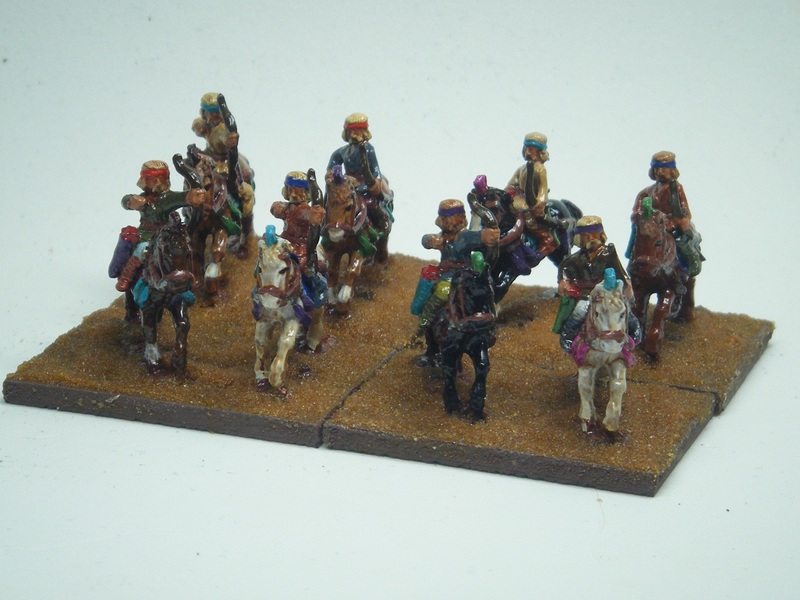 It does mean that I'll have to rig up a thingummyjig to hold the riders while I paint them and that they might be less securely fixed on the horses. I reckon that glue, gloss varnish, Klear and final matt spray coat should keep them fairly secure, and it will make painting less fiddly. So, expect to see posts titled "Tamsin's Equine Development Facility" at some point in the future. I had said that I'd move onto my javelin troops next, but the light cavalry's horses were nagging me (pun intended) so I made a start on them last night. I decided to paint them in a more sensible order - riders first, then horses. Well, sort of. I did leave some details on the riders unpainted until after starting on the horses as I'd be using the same paints on rider and horse. They should get their gloss varnish coat tonight, leaving just the Klear/ink coat for tomorrow morning before I can base them up. Hmmm, I might even be able to use them in my FoG battle on Monday night - will need to play around with my army lists. 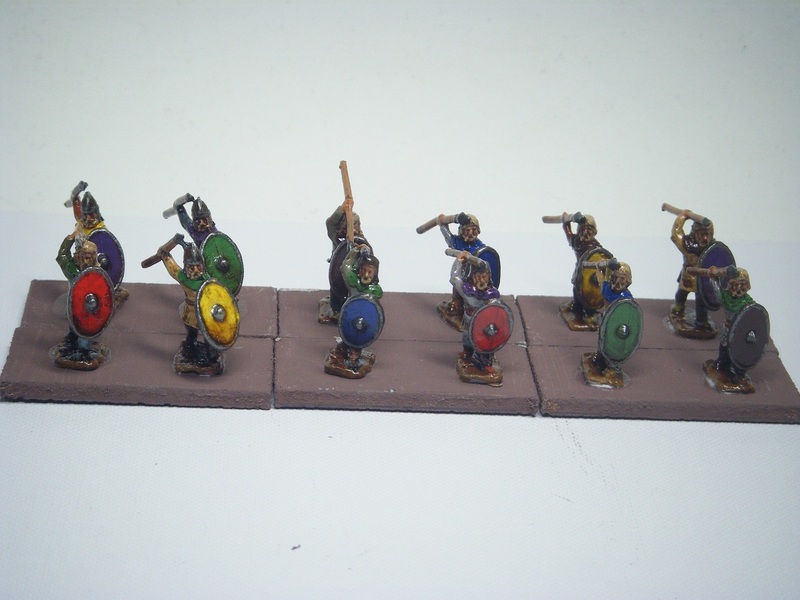 Next up for painting are the javelin troops. After that I can spend some quality time painting up my command groups. This was my first game of FoG for just over 2 months and only my 4th game ever. 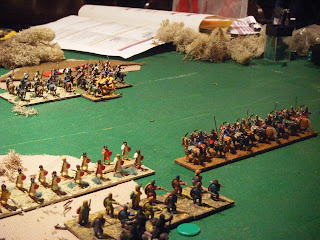 It was also the first outing for my Sarmatians, so I was looking forward to finally getting them on the table. 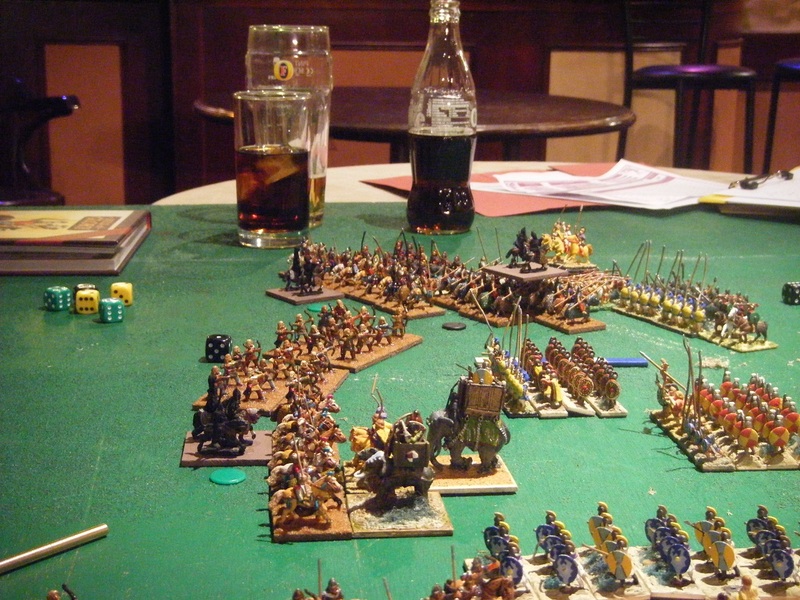 As this was a friendly practice game for our club's tournament, the armies would be 650 points maximum and the battle would be on a reduced size table (3' x 4' with terrain maximum szes reduced accordingly). My opponent, Alan, had told me that he'd be bringing an Alexandrian Macedonian army, but brought an Early Successor army instead, not that it made a great deal of difference. 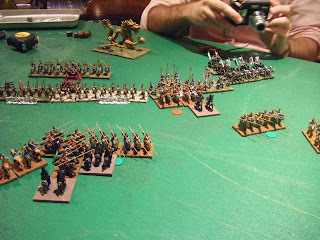 4 4-base BGs of "Other Cavalry"
We diced for pre-battle initiative - I was on +3, Alan on +1. He rolled a 3, I rolled a 2 so I won and chose Steppes as the terrain (what a surprise!!). We selected terrain pieces (each of us could choose 1 compulsory and 1-3 optional items) which gave us 3 open terrains, 1 gully and 2 brush-covered rough grounds. On to placing them and at this point the Dice Gods chose to play cruel tricks on me with the tresult that the open areas were in places where they were next-to-useless whilst Alan was able to get the terrain that would be awkward for me in areas where it would restrict me (ie - the centre of the battlefield). Grrrr! 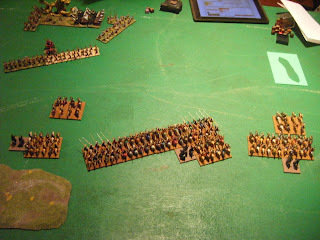 Alan had to deploy first, and put down 3 BGs of pikes; I deployed my light foot archers on the same side of the table. And so it went on. I realised my big mistake later on and also what I should have done instead. Note to self: DO NOT deploy lancers in the battle line facing pikes!!!! Or if you do, make sure they stay out of charge range of them until they are disrupted! Turns 1 and 2 proceeded with very little action, just moving towards each other. My light foot did manage to get some shooting in and even managed to disrupt one pike block. Turn 3 saw a little bit of movement, mainly on my right flank. In Turn 4, I discovered to my cost that I had accidentally brought my lancers to within 5" of Alan's pikes so they had to test NOT to charge - one BG passed, the other failed. Crash, bang, whallop - burst through 2 BGs of my light foot straight into 2 BGs of pikes. The impact resulted in them going disrupted and losing a base, the first casualties of the game. 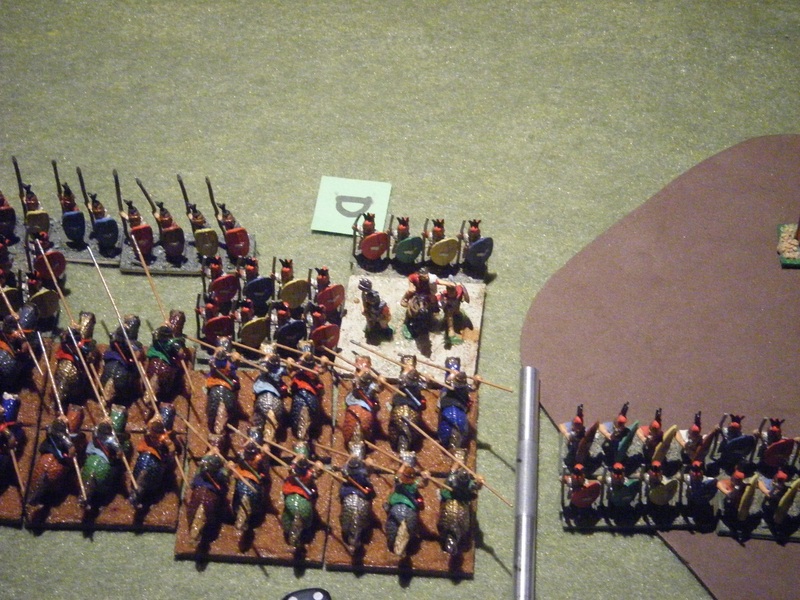 On my right wing, a BG of Other Cavalry did manage to cause Alan's Light Horse to run away. Unfortunately this cleared the path for his light foot javelins to disrupt, fragment and break my light foot javelin troops (even though they hadn't lost a single base). This left them in a very handy position to reach and sack my supply camp. That's right, run away from us you cowards!! "You're meant to fight them not run away!" 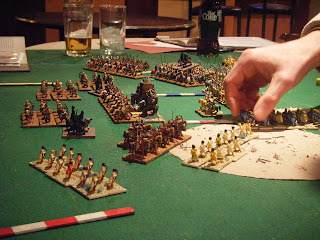 "Well, if you hadn't given us bent spears we might have stood a chance"
It all got rather messy from that point onwards, although my impetuous lancers did manage to break one of the pike blocks, but in doing so lost enough bases that they reached the auto-break point. 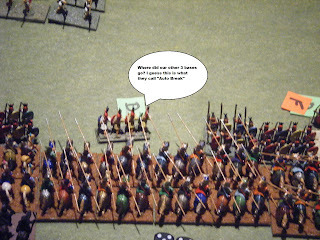 "Those pikemen don't like it up 'em Mr Mainwairing!" And then the elephants got involved. 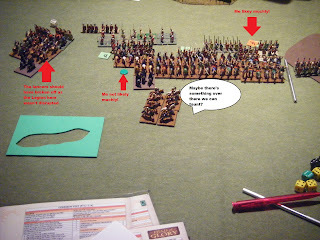 The various impacts and melees succeeded in breaking enough of my BGs to cause an army rout. Whoops! The other BG of armoured lancers breaks, game over! Despite the loss, it was a fun game and an excellent learning experience. 1. The Dice Gods are capricious - sacrificing to them does nothing, they regard those who do so as folls to be toyed with. 3. Don't deploy lancers in front of pikes, or if you do ensure that you keep them out of charge distance until you are ready. 6. Make sure your open wing has a general in command range to help the BGs there. I definitely need to reconsider my army list for future games. In retrospect I probably had too much light foot in the army, and having the lancers in 6s when the pike blocks I was up against were only 2 bases wide wasn't sensible. I might take some or all of the foot archers as medium foot instead - more shooting dice over the same frontage should help soften up the opposition for my cavalry to charge in against. WIP: Sarmatian "Other Cavalry" #08 - finished!! !